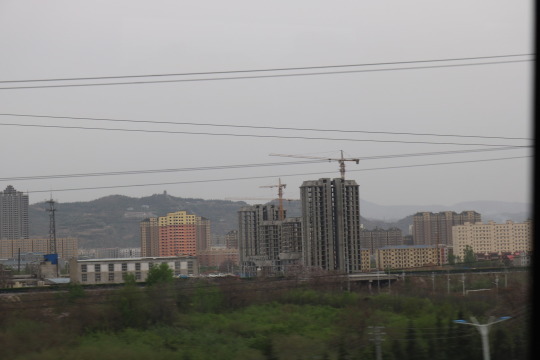 The train ride to Xi’an felt like a similar but more immersive experience as our car ride to the Great Wall. About an hour into the five hour trip, we’d escaped the overwhelming haze of Beijing and huge farms took up our view on either side. It’s impressive how much of this farmland exists, connecting large towns and small cities, nearly all with giant high rises, completed or not. 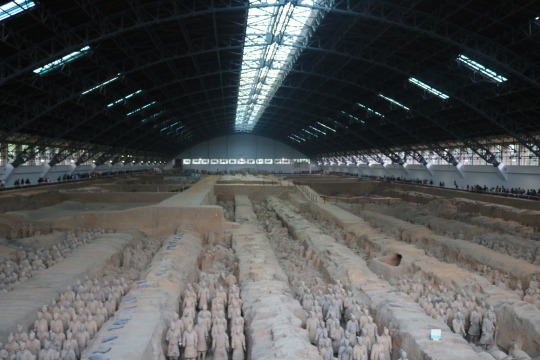 The main attraction and the reason for much of the tourism to Xi’an is the Terracotta Warriors excavation site. Discovered in the 1970’s by a farmer roughly 40 miles outside the city, these are a giant collection of plaster warriors that were buried with a former emperor. The warriors were all created with different features and according to the military designation they held. The army was set up according to the military formations of the time. The emperor, Qin Shi Huang, was the first emperor of China after uniting the states around 250BC and proceeded to burn all the books so that history would begin with him. The night I arrived was spent having beers with a British couple, New Zealander, Canadian, and American at the hostel. It was great listening to their stories, particularly the Brits who had just spent a month traveling across the States and had roughly 9 months left on the road. I finished it off with a little Rocky Raccoon on the hostel’s out of tune guitar. I spent day one walking around the city and viewing some of the other big attractions. 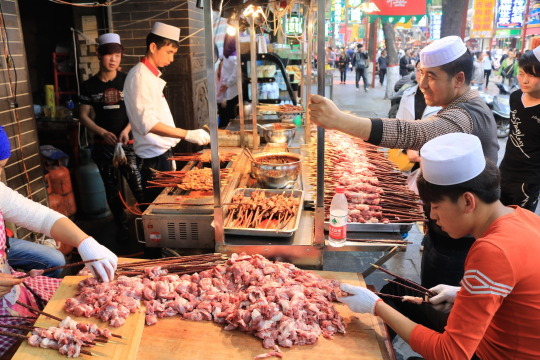 Xi’an was the capital several Chinese Dynasties, particularly during times described as the height of Chinese culture. The city sat at the eastern end of the former Silk Road and that helped it develop into a cosmopolitan city before almost anywhere on Earth. 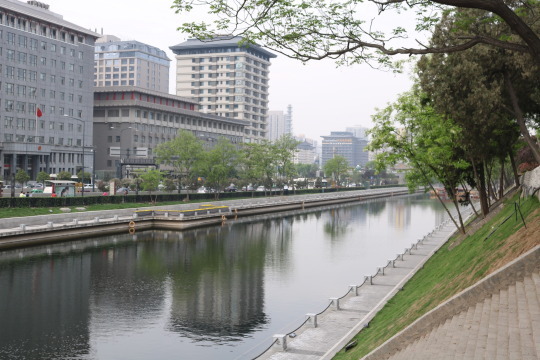 The inner city is surrounded by a 40 foot wall that has been well restored and maintained and sits inside amazing park areas and a huge moat. I got to see all of this on a weekday, when it seemed every grandparent was out playing with their grandkids. It’s hard to have any hard feelings about the Chinese after seeing these families. Maybe it’s that grandparents and grandkids don’t seem to have many worries, they’re happy to be around each other. 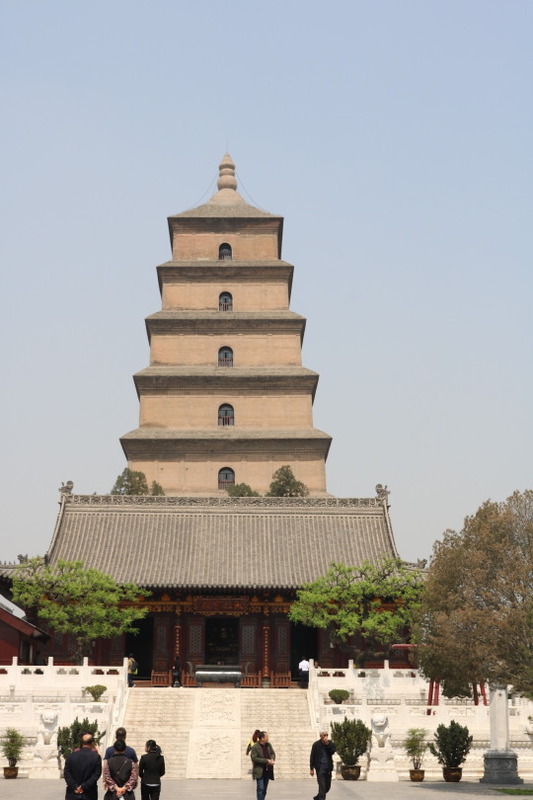 I continued from the city walls to the Big Wild Goose Pagoda, a giant structure that was built to house Buddhist scriptures brought back to India by a monk in hopes of protecting them from fires. The entire area surrounding the Pagoda is an awesome shrine to the Buddha, with beautiful statues, carvings, and paintings. It’s a spiritual and quiet place where a number of Chinese, presumably from elsewhere in the country, are praying and paying their respects. The other Westerners were all respectful as well, aside from our tourist attire. There were, however, a number of young Chinese people taking selfies within the shrines, acting loudly, and showing little respect. I began to lose my patience for the 20 something year old Chinese. I checked out the gift shop and while deciding on some small animals carved from jade, got a serious taste of how far bargaining can go. This gift shop was a bit out of the way from the action, and there wasn’t much action on Thursday at noon, so I stood in this large gift shop with 5 women all working on the sale. The sticker price on each piece was 650RMB, far too expensive for two stones about the size of casino dice. I said no, she asked for my price, and I said 800RMB, still more than I wanted to pay. She said ok, but I analyzed them more and decided to leave without the stones. As I walked out, they barked and yelled at me, ‘What price? What price?’. I held strong and walked out, but about 200 yards toward the exit of the complex, the woman I was talking with had run me down and offered 500RMB for both. At this point, I had no interest, but learned an important lesson. 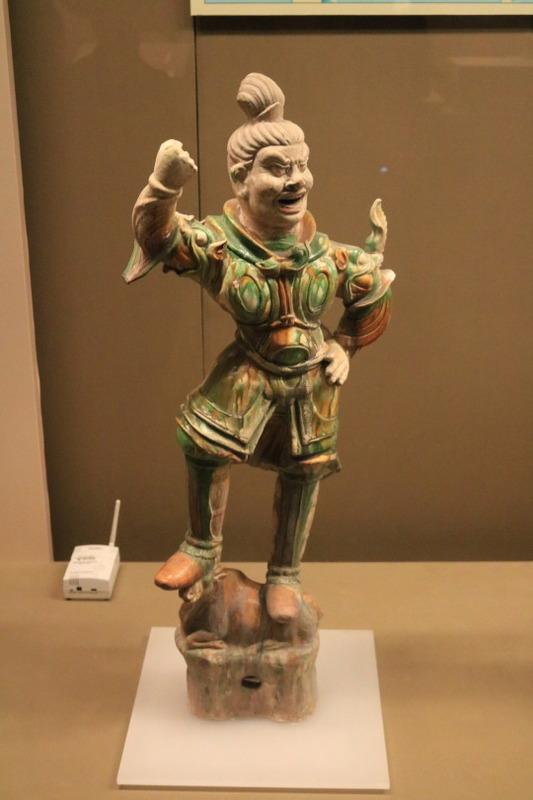 I grabbed some food and checked out the local Shaanxi History Museum which houses a bunch of artifacts showing off Chinese technological advancements and art. For 20RMB, just more than $3, I was able to skip a 30 minute line and enter immediately. The economic and class distinctions are real. The museum was a nice place and had a lot of very old artifacts, but there were too many people to enjoy and settle into it, so I left and headed to the subway. 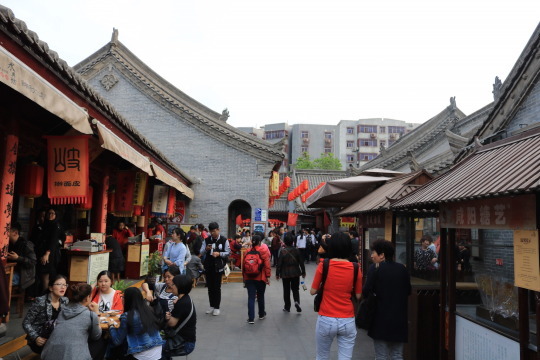 I got off at the famous Drum Tower and headed for the large Muslim quarter, near the city’s big mosque, and the location of the most popular shopping street in the city. 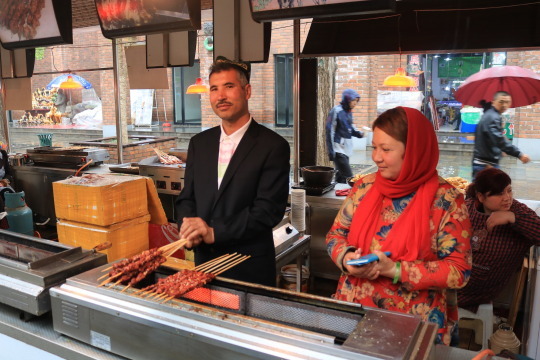 As with many of these tourist streets, the first 50 yards of stores sold the same things as the next 500, but it was great dealing with the merchants, men wearing fez’s, women with burkas, and zero pork. I gobbled up some Middle Eastern-esque tofu and headed toward the eastern part of the city where I was told there was great Chinese food. As opposed to the Muslim shopping street, this area had no Westerners, only Chinese locals. Of course, nothing was written in English so I found a restaurant with pictures and ordered some dumplings. I headed this way because of a recommendation from a girl working at our hostel. I’ve learned that these are usually the best people to ask for tips as they’re probably locals, they can speak English well, they’re young, and they understand that you don’t want to be around tourists. Finding locals who have a good grasp of English is an invaluable resource. Overall, avoiding tourist areas and being the only Westerner in a ‘restaurant’ has led me to the best food. 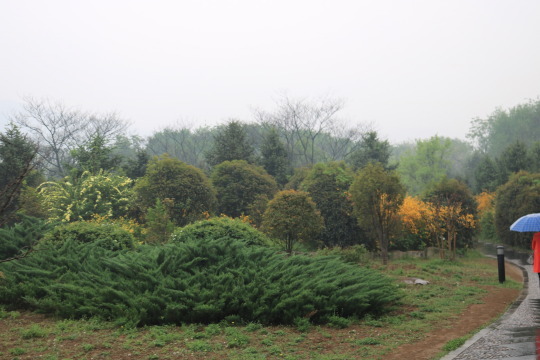 The next day I woke and headed to the Terracotta Warriors, an 8RMB and 50 minute bus ride in the pouring rain. We arrived fairly early, before 11am, and the walk from the parking lot to the excavation sites was quite nice. When I finally arrived, I was surprised by the crowd, as there weren’t many people in the park area that we’d just walked through. It’s remarkable how big of an attraction it is and how much money it generates, charging 150RMB for entrance. I walked into the large building which houses the largest pit and it was completely packed. The attraction is absolutely huge, but the visitors just walk around the outside and peer into the dig. The Chinese are quick to point out that it’s a UNESCO World Heritage Site, and it’s hard to imagine exactly how much money it has brought to the area. 150RMB was more than I would pay for any single attraction up to that point. 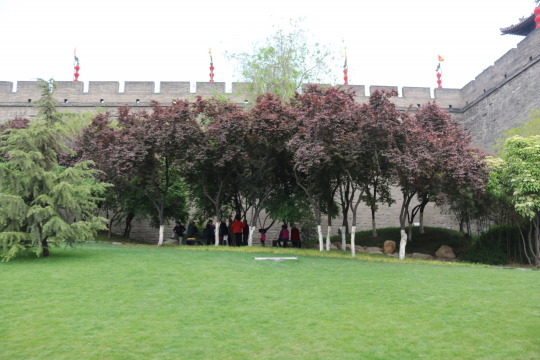 I moved through the multiple pits fairly quickly, trying to have some peaceful moments but mostly fighting with Chinese people for a good view. I was happy to return to the rain, take some pictures from outside, get molested by shop owners to buy crappy gifts, actually buy some food from a cute Muslim couple who loved to hear that I’m from San Francisco, and hop on the next bus to head home. Overall, it’s an extremely impressive attraction, especially its size, but not worth traveling around the world for. Maybe if I arrived when the doors opened. Lesson learned. I spent the rest of the rainy day searching for post cards, writing, and preparing for the next day’s trip to Lanzhou, where I would meet up with Willard and take a 5 hour car ride to Ritoma, near Gannan on the Tibetan Plateau. 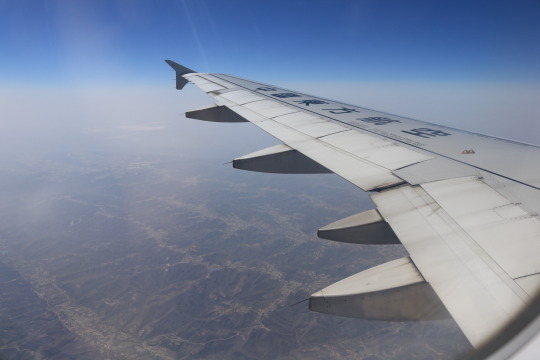 I had no plans to make the trip to Tibet when I arrived in China and made the flight reservation days before. It ended up being one of the best decisions of my life.